Industry leading cycle times—punch holes in less time than other ironworker machines. Automatic Urethane Hold-Downs—This unique Piranha feature, coupled with a low rake angle, keeps parts from deforming or shifting during the shearing process. The hold-downs work automatically, eliminating the need for time-consuming adjustments between cuts. The Piranha Model P-110 Ironworker is a strong workhorse capable of performing in heavy applications. It places second to the most powerful in our line of hydraulic ironworker machines which includes P-50, P-65, P-90, P-110, and P-140 single-operator ironworkers, and PII-88 and PII-140 dual-operator ironworker machines. The P-110 hydraulic ironworker has more standard workstations than any other ironworker machine in its class. 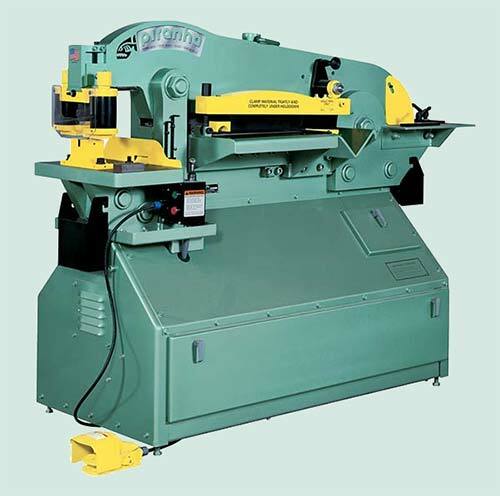 This includes punching, bending, bar shear, angle shear, round bar shear, and an integrated coper/notcher. The P-110 has full electrical control of its stroke with a foot switch and limit switch stroke controls. The no slug-loss shearing saves material, keeps the machine area cleaner, and offers larger material capacity than the competition. A wide variety of optional tooling is available to enhance the P-110’s capabilities. Plate Shear 20-1/2″ Long 1″ x 12″ 3/4″ x 18″ 1/2″ x 20″ Motor Std. 230/460 3 Ph. 1800 RPM Opt Phase & Voltage Available 10 HP 3 Ph.